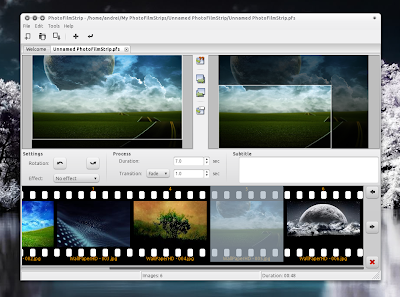 PhotoFilmStrip is an application for Windows and Linux that you can use to create a movie (slideshow) from images. It uses the "Ken Burns" effect for the pictures transitions and you can also add music and captions to your images. You can further customize the video by setting the duration time for each image, the transition and transition time and additionally, the effect (sepia or black and white). The video can be rendered in VCD, SVCD, DVD or FULL-HD (1920x1080). PhotoFilmStrip 1.4.0 was released yesterday, bringing (some of these features were already available in the unstable version like you can read in our PhotoFilmStrip review) a new user interface, customizable aspect ratio (16:9, 4:3 und 3:2), copy and paste for motion positions, Flash-Video renderer, a new transition (roll), better audio support, keyboard shortcuts and more. Download PhotoFilmStrip 1.4.0 (includes .deb file). Thanks to LFFL for the news!